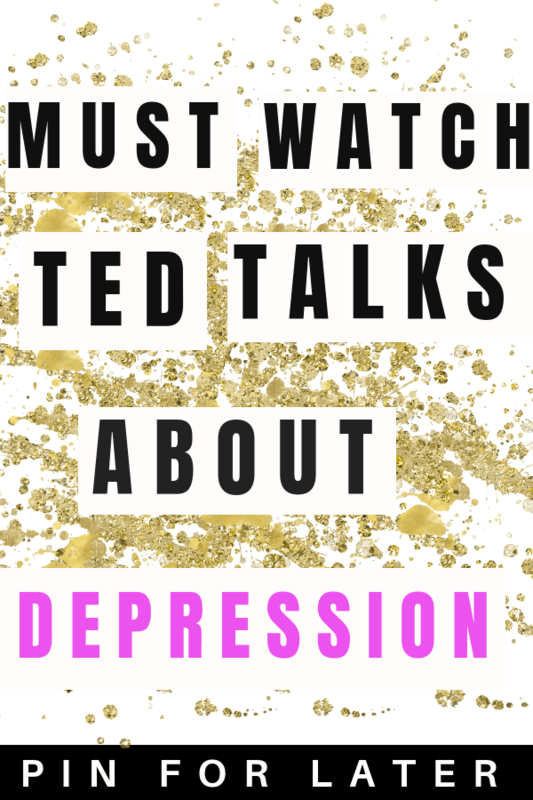 I went down the rabbit hole of TED talks again and I thought I would share these awesome TED talks about depression. These aren’t all uplifting but sometimes you need to hear some realness. Positivity kind of feels like a big pile of garbage when you’re depressed anyways (if you’ve ever tried to watch a motivational talk when you’re depressed you probably know what I’m talking about). If you’re depressed and looking for resources check out my articles on depression and download my free mental health planner. If you’re struggling with depression it can feel impossible to start feeling better. I have added audiobooks, podcasts and TED Talks to my daily practice and this practice has had a huge positive impact on my life. I listen to positive self-help information all day long and it has had a huge impact on my mental health. When I’m driving, at the grocery store, doing the dishes or at the gym I am always listening to new positive messages. Listening to self-help material has done two things that have really helped me manage my depression. Listening to self-help material every day has given me tons of new strategies and tools to help me manage my mental health. Strategies like the ones I learned in the 5 Second Rule and The Big Leap have helped me learn to become productive and to maintain a positive mindset. Consuming more information can help you learn new tools that you can use to start feeling better. When I was really depressed I had constant negative thoughts about myself and my life. I would really beat myself up and make myself more and more depressed. My negative thinking made me feel hopeless and I fell deeper and deeper into depression. I started using TED Talks, Podcasts and audiobooks (get 30 days of unlimited audiobooks here) to start distracting myself when I was in the middle of a negative thought spiral. After being clinically depressed for over 10 years my brain was conditioned to have a negative outlook on everything in my life. I started to intentionally drown out my own thoughts with the positive messages of other people. Eventually, it helped me to start feeling better. 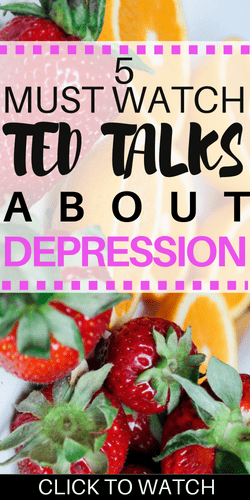 These TED Talks about depression are all excellent for you to listen to if you’re struggling with depression. I hope they will help you learn some new strategies for managing your mental health and help interrupt any negative thoughts you are having. David Burns talks about using cognitive therapy to treat his depressed patients. He helps his clients to change how they think in order to change how they feel. If you’re having a lot of negative thought patterns this would be a great TED talk to watch. Changing your mindset can help you manage symptoms of depression. Kevin Breel talks about breaking the stigma of depression. If you are feeling depressed and feel like you are alone trust me you’re not. There are lots of us out here struggling with depression. I have a mental health support group on Facebook that you can join if you are looking to connect with other people who are struggling with mental health. So many people are ashamed of being depressed and never get the help that they need. I spent years suffering with clinical depression before I ever did anything to try and help myself. During the time I was depressed I wasted years of my life and missed out on many experiences. If you’re struggling I urge you to reach out sooner rather than later. Zindel Segal has been treating his depressed clients by teaching them to appreciate the present moment. Try out the techniques in his talk and see if you think they can help you. He did research around what triggers depression in people to figure out what actually causes the symptoms. By teaching people to pay attention to the present moment and not be judgemental he was able to help his patients manage their depression. I love her story about communicating with her 2-year-old in a positive way. She started trying to practice unconditional positive regard with her kids and then started trying to practice giving unconditional positive regard for herself. Oftentimes many of us are so hard on ourselves and criticizing yourself can become a negative thought pattern. This TED talk gives you some strategies for focusing on the things you are doing well and what you are happy about in your life instead of the negative things. When I’m depressed or struggling with my mental health my inner dialogue is relentlessly critical and negative. Practicing unconditional positive regard helps keep me from going down a negative spiral. This is a kids TED talk from a girl that was hospitalized from depression and anxiety. This is a powerful story about how she was able to overcome and depression by telling her story in an honest way. When you’re struggling with depression it can be really scary to tell anyone and often time people suffer in silence. If you’re having a hard time telling anyone about what you are going through I hope this TED talk inspires you to reach out for support. 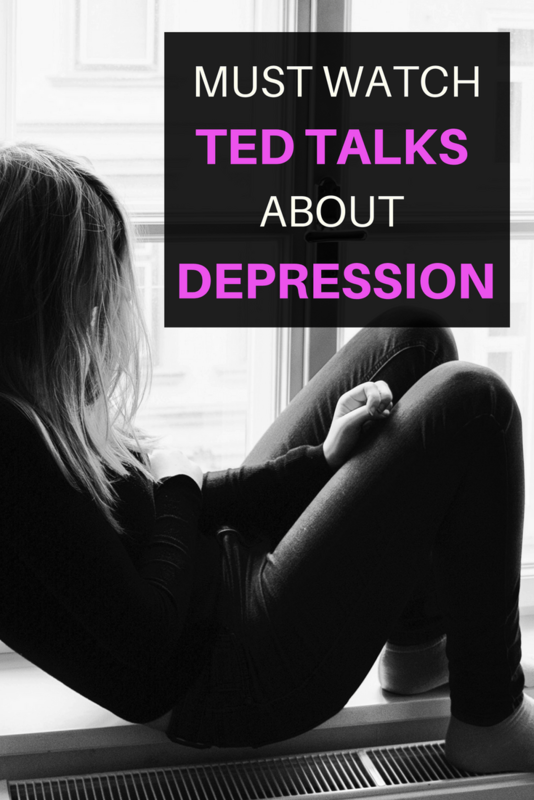 Thanks for checking out my post of TED Talks about depression. If you’re looking for more motivation check out my post of badass commencement speeches. 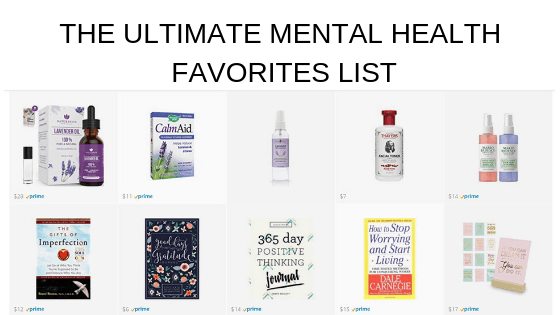 I have a ton of mental health resources on my site that I hope you’ll check out like my free mental health planner or my posts about depression. I hope you’re able to find some relief soon. I struggled with clinical depression for ten years but I live a great life these days and I believe that recovery is possible for you too. Want to remember these tips? Save this pin for later!